The shade features rich green panels with nice mottling in the arrowroot leaves. The background flowers are done in beautifully mottled white glass with wonderful yellow centers. The background glass is a rich striated amber glass with hints of red and brown. The leading has rich brown patina with highlights of green and red. 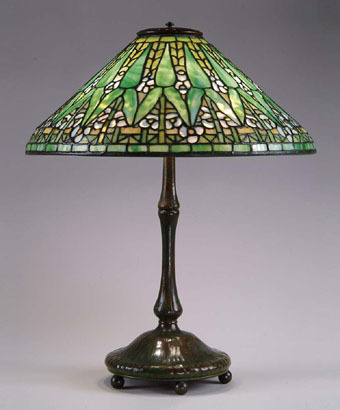 The shade is marked "Tiffany Studios New York 1496-8". The shade rests on a base which has five ball feet which support an inverted saucer shape bottom with light vertically ribbing and leads to a lightly ribbed stem which supports a three light cluster. Base is patinaed with mottled shades of browns, reds and greens. The base is marked "Tiffany Studios New York 394". SIZE: Shade is 20-1/2" dia. Overall height is 25".